The numbers within a tile must all be different. Horizontally or Vertically adjacent puzzle cells must not contain the same number. 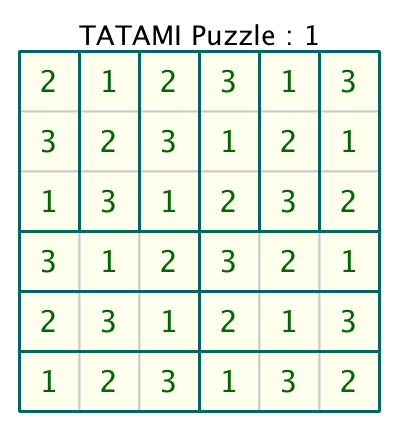 Each row and column of the puzzle must contain the same number of appearances of each number. Some of the puzzle cells will have a number already inserted to get you started. 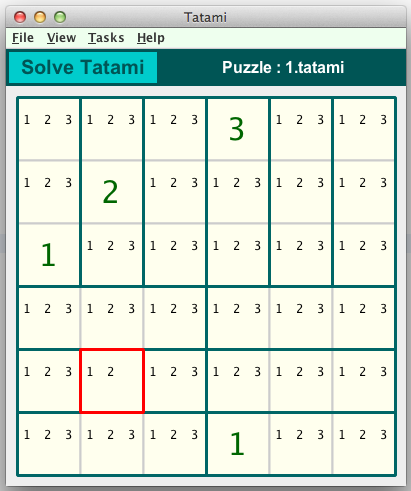 The following graphics show a Tatami puzzle in the Crossword Express Solve screen and a PNG graphic file produced by the program's print function, showing the complete puzzle solution. See also a full size version of a PDF file.